Always wondered how other countries decorate their homes and streets around Christmas time? We’ve asked our writers from around the globe to reveal their country’s more unusual and distinctive traditions, from pooping figurines to life-size nativity scenes. ‘I think Christmas decorating in the Philippines is very interesting as it’s a mix of both Catholic (from the Spanish) and Western (from American media) influences. 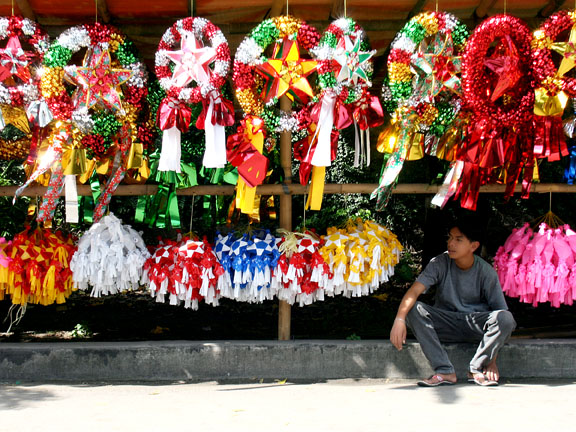 Just as in the States, Filipinos absolutely love going all out on the Christmas decor. Shopping malls, streets and homes are all completely decked out during the holidays. But while the “commercialisation” of the holidays is quite evident, the more religious aspect is not lost, seen for example in the ever-present belen, or the depiction of Christ’s nativity in Bethlehem. For homes, it’s usually on a table in the living room, but you’ll see life-sized ones displayed in malls as part of the decor. ‘Also, around November, our teachers would tell us to begin bringing Christmas decorations into school. We each had to contribute something. Many would bring a shiny garland, some would bring recycled parol (made of plastic bottles and straws), some would bring Christmas lights, and one might even bring a small Christmas tree. We’d then take some time after school hours to decorate our classroom. I just loved this tradition growing up because now, looking back, it seems to me very representative of how Christmas in the Philippines is such a social event, from food preparations to every other Filipino Christmas tradition – they’re all aimed towards bringing the community together. ‘Poland is pretty similar to Slovenia – the tree will be set up a few days before Christmas at most, and the main celebration is on Christmas Eve, which consists of a big dinner, wigilia, and opening presents. Christmas Day is more chill, hanging out with the family, watching Home Alone (for some reason TV stations always play Home Alone multiple times around Christmas, and it’s become sort of a joke that you always watch it). Religious people will probably go to mass at midnight after opening presents, and also possibly on Christmas Day, but it varies depending on the family. Decorations-wise, they’re pretty standard: A tree with lights, baubles, copious amount of tinsel, either a star or an angel on top, and themed table settings. Read on for more ‘weird and wonderful’ Christmas decorations from around the world here.